Shugo Chara! Doki!! : Speculation about Episode 96: What are the chances of the Amuto hug? ^ This one right here. Considering the time we have left, which is about 6 episodes give or take, I’d say high. Satellite love twisting the manga plot and there’s no wayyy we can get the tower scene now, (even though the setting is perfect for a last battle imo). Lets put it this way, if they pull off the hug in an amazing anime original Amuto, doki doki, un-kira kira, moment, I will forever forgive Satellite for their countless plotholes and facepalm moments we’ve had over the past season. Anyway, lets hope Satellite do a good job. The fangirls’ sanity depends on it. 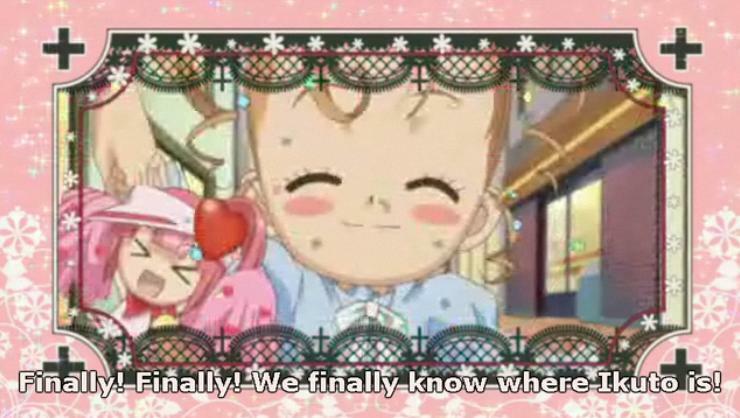 This entry was posted on Sunday, August 9th, 2009 at 4:49 pm and is filed under Anime, Shugo Chara! Doki!!. You can follow any responses to this entry through the RSS 2.0 feed. You can leave a response, or trackback from your own site. 4 Responses to Shugo Chara! Doki!! : Speculation about Episode 96: What are the chances of the Amuto hug? You want my honest opinion? I really don’t think it’s going to happen. Knowing Satelight, they’ll want to milk this franchise all they can. And what’s a good way of milking? By giving both main medias different endings, of course! The hug may or may not happen. If something like this arises, usually I can tell correctly which way it’ll go… but not today. Odd. Yes at the end of the day Satellite are milking machines. They want to get as much out of Shugo Chara as they can, of course. Yeah as you say, Satellite could go a completely different direction from the manga, (despite bringing Taiyaki kiddy in…). But Satellite can do things right (as much as I love to insult them~) when they…try. For example as I said above, we got more insight into Rima that we didn’t get in the manga. But to balance it out they gave Tsukasa an underground lair (*sigh* this’ll never get explained, like everything else Tsukasa related). Yes, it may or may not happen. It’s hard to predict. But I’m getting my hopes up because I’m just a fangirl like that! Hopefully I won’t get shot down, so fingers crossed! Well, yes, we can always hope. And don’t think I don’t want to see the hug animated. I’m just worried… Maybe I’m just being pessimistic because I’ve been trolled by KyoAni so much this year of 2009. But that’s a different story.